​Need a hand with paving or sealcoating an old driveway? 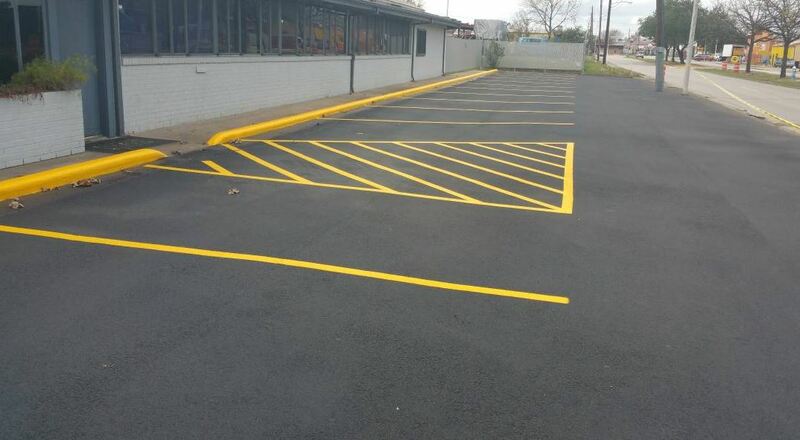 Maybe it's repainting and striping a parking lot or filling a pothole? Our company services Norfolk, VA and we are the best paving contractor in the area, working at very affordable prices. Basically, it's compromise of the asphalt, which is the result of water getting under the pavement, which causes the ground beneath to shift. When the ground becomes unstable, it makes the asphalt loosen and can break away, forming a hole. Typically - after a long, hard winter the roads are hit hard because they are treated with a salt mixture, or brine. As many might know, salt is a major component and culprit in the breakdown of asphalt. When you combine that with the ice and snow that settles on the roadways, when it melts, it can penetrate the pavement and cause damage to our roads. If you mix the now “melted snow and ice” with the salt, it is a very dangerous liquid that now can seep into the pores. It is THIS process that keeps the Virginia Department of Transportation, or VDOT, very busy! After a harsh winter in 2014, where the interstates took a beating against the winter elements. It was so bad that pot holes became as common as road signs. They were literally everywhere! Pieces of the interstate were missing, by the chunks. Many cars suffered road damage and flat tires, leaving the interstates strewn with broken down vehicles all over the emergency lanes. This was due to the direct result of running over these pot holes, with little to no warning before riding upon them. It took VDOT some time to get the holes filled in and they worked with motorists to assist with the repairs to their vehicles. It was so bad that the local news had a segment in which they talked about “Pot Hole Patrol” and would have residents call in to report pot holes in their area that needed attention. ​Not only do our main roadways and interstates require maintenance, but so do our secondary roads. Much of the travel that occurs in Norfolk is in and around the Universities and the Military Bases. With these roads being so heavily traveled on it, is wise to ensure that the roads are well maintained, to cut down on the repairs, and in turn, prevent any road closures which ultimately create more congestion in these areas. We have all had our fair share of sitting in traffic because a lane is closed for construction. It’s no fun, but we also know that it is necessary. Without it, we could find ourselves even more frustrated when the entire road needs to be shut down, for repairs. That makes for a bad day, especially if you are running late! Another good area to maintain is the exits and on ramps of the interstates. These are as widely traveled as any major roadway. When you take care of these, you are ensuring safety for all motorists, who are speeding up and slowing down as they travel the roads. Imagine how dangerous it would be to exit off the interstate to an exit ramp that was constructed of gravel. Well, if the ramps are maintained to seal them against weather, there will be fewer pot holes and less shifting blacktop! Hence, no gravel that surfaces from beneath the asphalt and certainly no pot holes. Norfolk has had many other issues with sink holes in the downtown area, which have caused another traffic nightmare all their own. They cause traffic to have to be rerouted, road closures, and expensive repairs to fix the problems. The City has done a good job of expediting the issues as they arise, and they seem to fight an uphill battle, all the time, against water damage to the roadways. Be sure to take a good look at the city, especially in the downtown area, the next time we get torrential downpouring storm. ​The job of maintaining the asphalt in and around the City of Norfolk is an endless nightmare for the road workers, but they always manage to successfully work through the issues with city streets that tend to flood out and make sure that roads are passable and safe to travel on. If you are looking for a reliable company for you project, call us at ​(757) 364-0371 or press the button below.